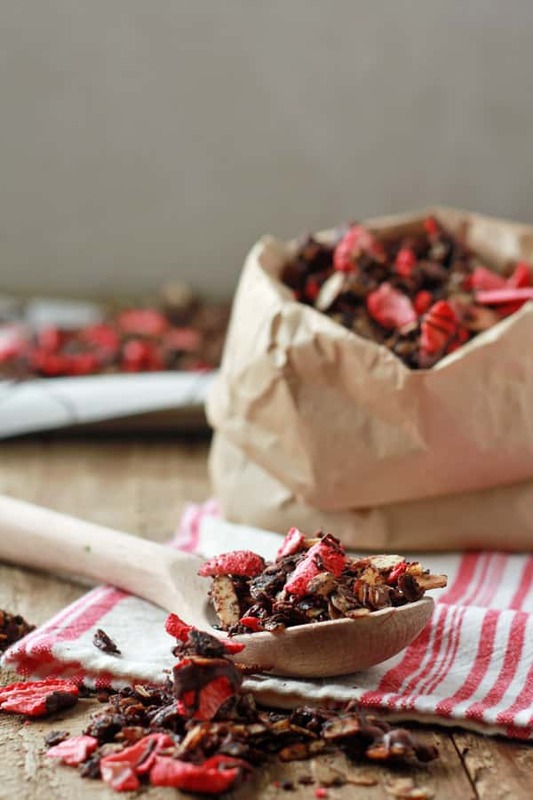 Chocolate-Covered Strawberry Granola Recipe from Oh My Veggies! It’s true … I’m a granola fiend. Ever since I discovered how to make my own granola at home (and just how unbelievably easy it is), I’ve been a bit crazy for it. Every week or two, you can usually find me in my kitchen whipping up a new batch, almost always doing something to tweak it here or there. Because I can never leave well enough alone. This Chocolate-Covered Strawberry Granola, however, is the first time I’ve gone all crazy chocolate bonkers with granola. It will so not be the last. Rolled oats, coconut, and almonds tossed in a sweet, chocolatey glaze and baked to toasty aromatic perfection. Then we add strawberries–tart freeze-dried strawberries, to be exact. Because fresh strawberries would lead to soggy granola, and nobody wants that. And then, THEN, a dark chocolate drizzle. 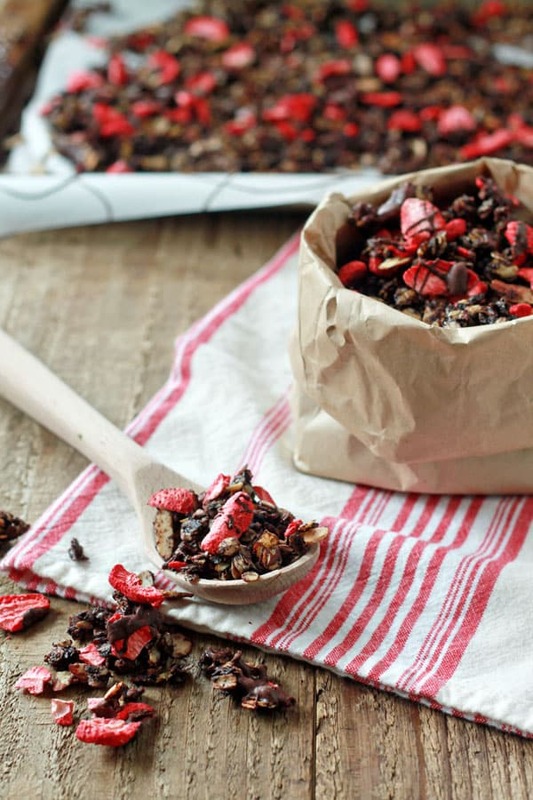 Just to ensure that this granola is complete and utter chocolate-covered strawberry bliss. If ever granola could be considered romantic, well … I think this is a good start. I, for one, am completely in love with it. Oh, and it’s a nice, flexible recipe, too. It’s still plenty delicious if you’d rather omit the chocolate drizzle. And if you prefer a vegan version, a couple of swaps will get you there: Just substitute vegetable oil or more coconut oil for the butter and replace the honey with pure maple syrup. Hearty, chocolatey, and addicting. Tart freeze-dried strawberries dot this decadent granola; a dark chocolate drizzle sends it over the top. Preheat oven to 325°F. Line a large rimmed cookie sheet with parchment paper or a silicone mat. Add the coconut oil, butter, and honey to a small saucepan over medium-low heat. Heat, stirring occasionally, until the butter and coconut oil melt. In a small bowl, combine the brown sugar and cocoa powder. Pour this into the coconut oil/butter/honey mixture and stir with a whisk, stirring constantly until smooth, about 30 seconds. Remove from heat and stir in the salt and vanilla extract. In a large bowl, toss together the rolled oats, almonds, and coconut. Pour the wet mixture over the top and stir well with a wooden spoon, until most of the dry ingredients are coated. Spread onto the cookie sheet and bake, stirring every 10 minutes, until the granola is fragrant and beginning to turn golden brown--about 30 minutes total. Remove from the oven and let the granola cool to the touch, about 10 minutes. Break the pieces up with your fingers, then let the granola cool the rest of the way. Once cool, add the strawberries, breaking them into smaller pieces with your hands as you mix them into the granola. To melt the chocolate, use a double boiler or place an oven-proof bowl over a medium saucepan of barely simmering water. Break the chocolate into chunks and place them into the double boiler/bowl, stirring constantly just until melted. Drizzle the chocolate over the granola and allow to cool until hardened, 1 to 2 hours. With your hands, break up the granola to distribute the chocolate and transfer to a bowl or storage container. Store in an airtight container at room temperature for up to two weeks. Note: don't let it get too warm, or the chocolate may melt and you'll have messy granola on your hands (literally)! This granola looks so awesome, I would definitely eat it as a snack all by itself. If only I could find freeze-dried strawberries here. Dried are just not the same and usually full of sugar. Sorry about that. 🙁 For what it’s worth, it’s not quite the same without the strawberries altogether, but still pretty dang good! i love making homemade granola – this is just perfect. This looks like it would make a great breakfast or dessert! homemade granola has changed my life too! This version sounds absolutely wonderful! Thanks for sharing Kare! I love this! Freeze-dried strawberries are a secret vice of mine. I used to pick them out of my cereal and eat them first because I love they way they crunch and then soften when I bite into em. >< Pinning! You had me at granola…than you added chocolate covered strawberry to the mix and there was NO turning back. I need this in my face like now! I’m with ya 100%!!! Now, show us how to freeze dry strawberries :). I am all for a little chocolate in my granola, this is gorgeous! OMG, I wish I could just gobble this right up! Wowwza! Right?! Plus even the most mediocre batch of homemade just beats the pants off of store-bought. And it makes the house smell incredible when it’s in the oven! Okay, I am no longer allowed to complain about my nearest Trader Joe’s being 20 minutes away. 😉 I’ve been wondering how it would turn out with regular dried strawberries. If you try it please let us know how it turns out! I probably don’t need any other dessert on V-Day. Just a big bag of this. Oh my goodness… this is the most amazing looking granola I’ve ever laid eyes on 🙂 Definitely making this, perhaps with quinoa flakes instead of oats since it’s hard to find certified wheat-free oats! Looks so good! Woah! This is the best granola I have ever seen!! So fun and perfect for Valentines Day! This looks amazing! Beautiful recipe. That is so freaking cute!! I’ve been sprinkling it on top of Greek yogurt along with sliced bananas for breakfast, and it’s great! I would love some of that to put over vanilla Greek yogurt right now for a snack! This granola is actually dessert! I used pecans instead of coconut because hubby hates coconut. Absolutely delicious!